It was late, maybe too late, and now the sun was dropping behind the Guadalupe Mountains. As shadows spread over forests high on the eastern slopes, a sense of doubt crept onto the trail. Where was Texas? Over the next peak? Or the one beyond? Like the range itself, my path into the Guadalupes had risen near the southern edge of New Mexico, south of Carlsbad and east of El Paso. For about three hours, I had been hiking Camp Wilderness Ridge Trail, a lonely segment of a new, 100-mile-long super route called the Guadalupe Ridge Trail. Naively, I had expected to reach the state line with daylight to spare. Clouds swept across the sky. The trail circled the nearest summit, cinching the mountainside like a belt. Here and there, the striking red bark of the madrone trees was peeling like paper, as it does each fall. Pale blue agaves with red-tinged thorns studded the grassier pitches. Hiking the Permian Reef Trail to the Texas-New Mexico line. Around the mountain, the trail emerged from stands of piñon, ponderosa, and juniper as I approached a windswept ridge—without a doubt, Wilderness Ridge. Ahead, the shadows were banished in the last rays of golden light, but a barbed wire fence interrupted the scene. A fence? Way up here? Separating me from the ridge’s precipice, it stretched through the yucca and the creosote in either direction, as far as one could see, a testament to the human effort to parcel our wildest of terrains. Then I noticed another oddity: an old turnstile in the middle of the fence. Next to it, in capital letters, a faded sign read, “Boundary Line.” I pushed the turnstile. It was made of wire and welded pipe, which creaked and groaned as I took a step and straddled the states: one foot in New Mexico, the other in Texas. On the other side, the world opened onto a staggeringly vast canyon. Bathed in the glow of the setting sun, I found a seat on a limestone ledge above a dizzying plummet of approximately 1,600 feet. A silvery ribbon of McKittrick Creek snaked through the canyon floor. Across the chasm, a darker and somehow even steeper landscape appeared to erupt into dozens of peaks, palisades, and craggy ridges. Many were fringed with the silhouettes of conifers, likely Douglas firs. More common to the northern Rockies, the firs can find purchase here only at higher elevations, on so-called sky islands in the desert. In that moment, it was clear the miles I’d already hiked—not to mention the hours of night trekking that lay ahead—were more than worth the effort. A gap in the mountains revealed the badlands of the surrounding Chihuahuan Desert, many miles to the southwest and several thousand feet below. 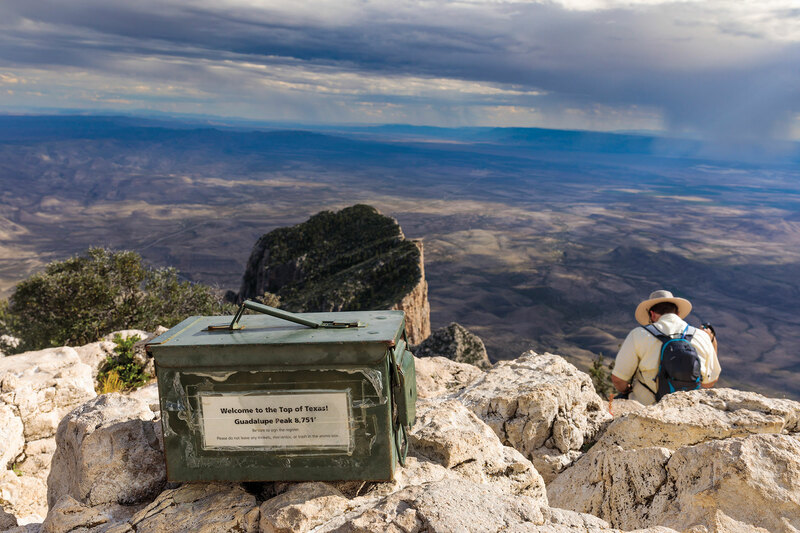 A metal box contains a register for hikers to sign when they summit Guadalupe Peak. 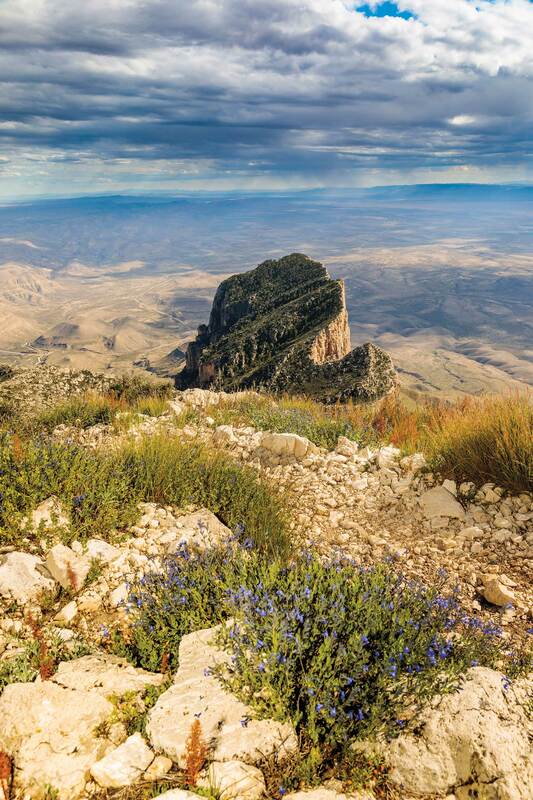 “Nature doesn’t follow those boundaries,” says Michael Haynie, a longtime ranger for Guadalupe Mountains National Park. The Guadalupe Ridge Trail is stark evidence of that truth. 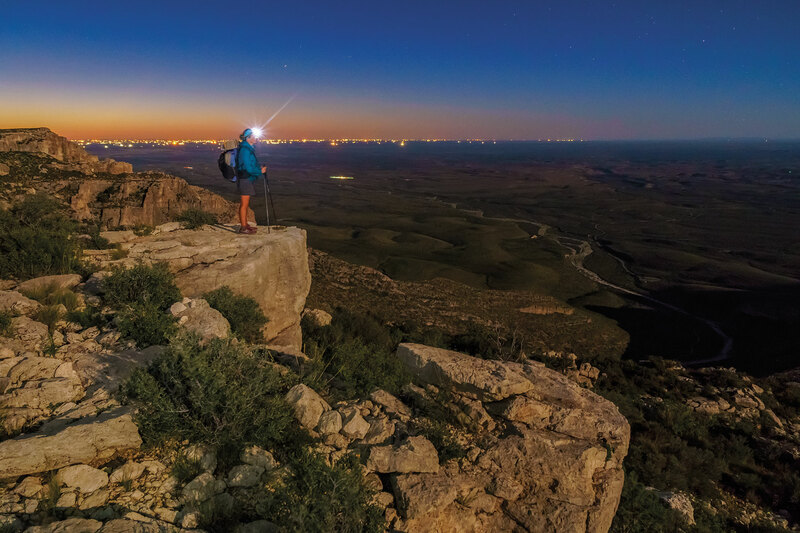 Pieced together from several existing trails, the GRT begins near the depths of New Mexico, not far from the entrance to Carlsbad Caverns National Park, and ends on the top of Texas—Guadalupe Peak, which at 8,751 feet is the highest summit in the Lone Star State. 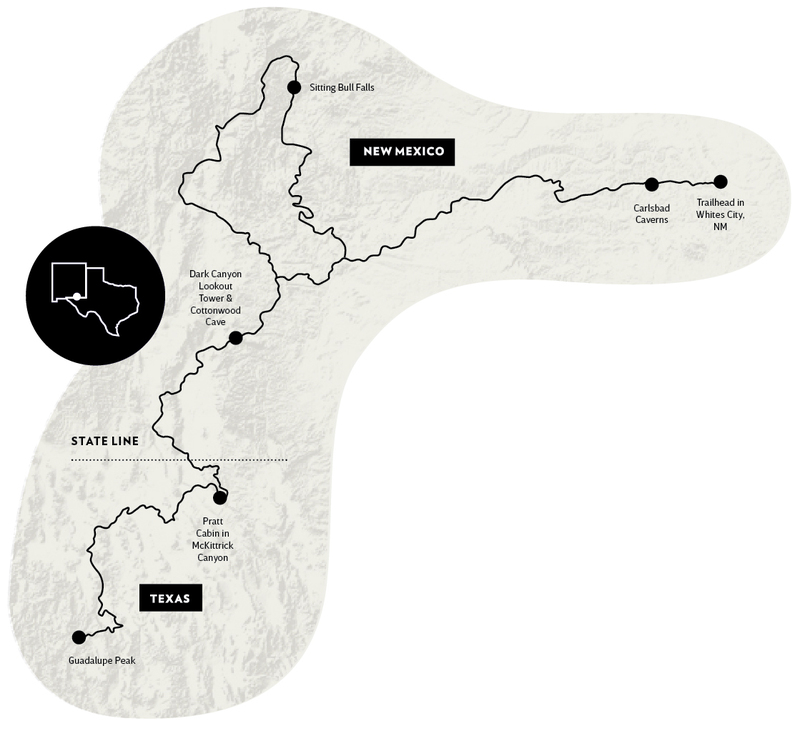 The trail connects Carlsbad Caverns and Guadalupe Mountains national parks via the Lincoln National Forest, most famously the site of Sitting Bull Falls, which tumbles from a spring-fed creek over a mossy, 150-foot-high canyon wall. An oasis flowing year round, it fills clear pools where visitors come to relax, wade, and cool down in an otherwise desolate stretch of desert. If you’ve been hiking for nearly a week on the Guadalupe Ridge Trail, you’ve certainly earned a dip and drink from the falls. 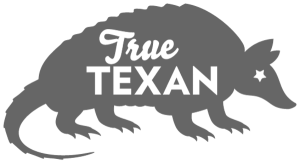 Or, for a less arduous experience, you could simply explore pieces of the trail. Particularly popular is a stroll through McKittrick Canyon when the leaves of the bigtooth maples burst into spectacular hues of orange, red, and gold in the fall. For decades in the 20th century, a Kansas native named Wallace Pratt enjoyed access to the best view of this autumnal explosion from the front porch of his rustic cabin deep within the canyon. Pratt, the first geologist for Humble Oil, a precursor of ExxonMobil, had first visited the Guadalupes in 1921. Enchanted, he soon began purchasing land in and around McKittrick Canyon and eventually acquired 5,632 acres of desert, canyon, and mountain for family getaways and, beginning in 1949, a full-time residence. Around 1960, Pratt and his family donated the land to the National Park Service to found Guadalupe Mountains National Park, established in 1972. Across the state line from the Pratt cabin, the trail skirts past hidden caves that pock the Lincoln National Forest. You can climb down into them (after securing a free permit from the nearest U.S. Forest Service office), or you can climb up the steel steps of an antiquated lookout tower where rangers once spent long days watching for wildfires across the ridges and canyons, out onto the desert. 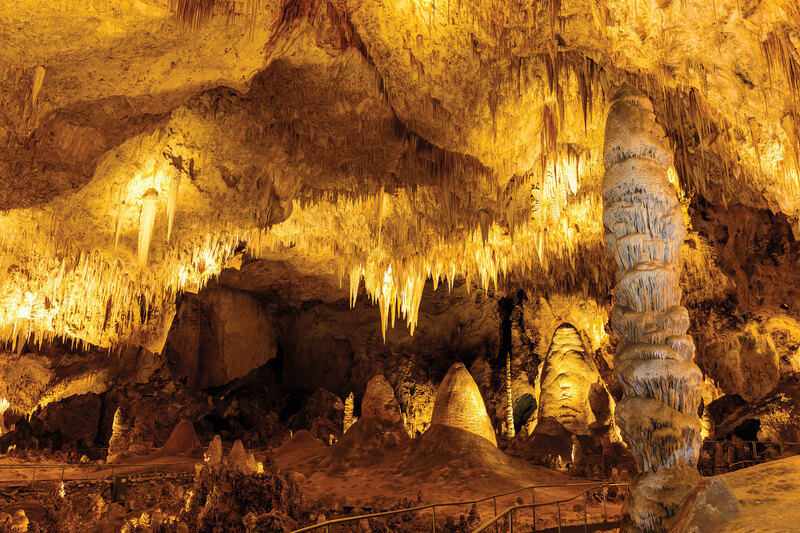 And, of course, Carlsbad Cavern is one of the world’s most famous caves. More than 1,000 feet deep, it is home to the Big Room, the largest underground chamber in the nation. Really, the entire mountain range is a world-class treasure: Formed by the largest exposed fossilized reef on the planet, it’s a remnant from a time when the region was submerged by a vast sea. 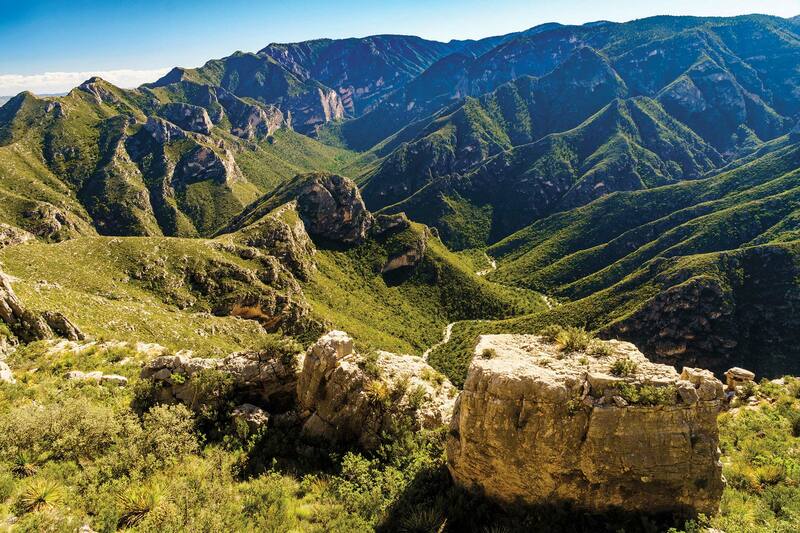 In much more recent history, the Guadalupe Mountains became the last stronghold of the Mescalero Apaches. Pushed into the mountains from their traditional homes on the Southwestern plains, they hunted elk and other big game, and they harvested plants—particularly agave, which dots the mountainsides of the Guadalupes. Providing both food and fiber for ropes, blankets, and sandals, agave is also known as mescal, hence the name given to the tribe by neighboring Apache bands and Spanish colonists. The Mescalero people were driven out of the mountain range in a series of brutal skirmishes with U.S. soldiers and cavalry troops in the late 1800s, but they return to the Guadalupes every year to harvest agaves for ceremonial purposes. Guadalupe Mountains National Park—GUMO to those in the know—comprises more than 134 square miles of mountain and desert on the Texas side of the state line. More than 60 percent of the park is designated wilderness, which can only be experienced via hiking or riding a horse. More modern forms of transportation like cars and bicycles are not allowed. In other words, get ready for a lot of walking. 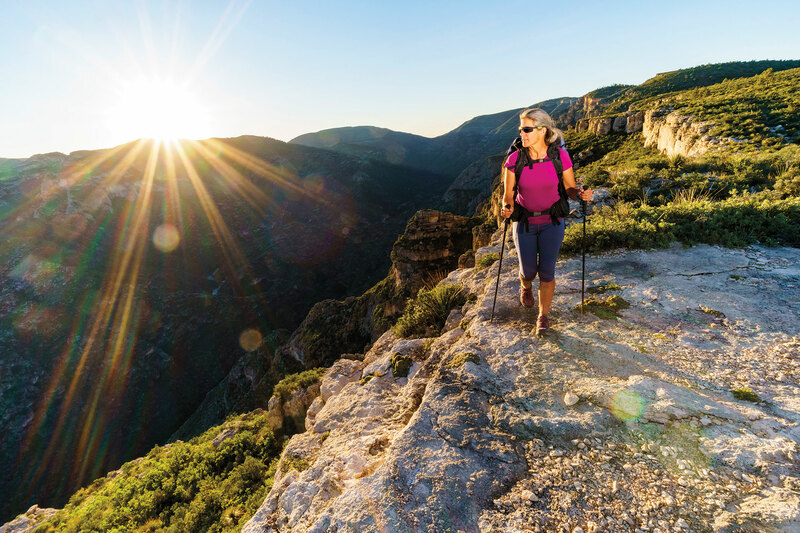 Jennifer Roach was in her early 60s when she joined four friends on probably the first through-hike of the Guadalupe Ridge Trail. The group, which Roach describes as experienced hikers but “not youngsters” from the nonprofit Highpointers Foundation, had been invited by parks officials to test the trail in April 2016. Flowers on the hike to Guadalupe Peak. Water is the major complication for hikers tackling the entire trail. Although there is some water to be found nearby in the national forest, there is none available in the backcountry of the national parks. At a recommended gallon of water per day, a hiker would have to carry seven gallons for a weeklong trek. Not likely. Rangers from the parks and Forest Service hope that someday a private outfitter will provide a water caching service, ensuring that hikers will be able to quench their thirst along the trail. I was unable to find anyone to cache water for me, so I ended up seeing the GRT in sections. McKittrick Creek snakes through the green mountains. for extreme swings in the weather, as Roach discovered. Summiteers of Guadalupe Peak describe blasting wind gusts in excess of 80 mph. Then you head down from the mountains and bake in the desert. It was getting warmer by the minute one sunny day last October when I turned off the Guadalupe Ridge Trail at the historic Dark Canyon lookout tower in New Mexico. The Forest Service locks the door that accesses the tower’s cab, but you can still climb the steps for panoramic views of the surrounding juniper-studded canyonlands. At the tower’s base is a red cabin, also locked, built by the Civilian Conservation Corps during the Great Depression. Next to the tower and cabin, a narrow footpath leads away from the main trail and out of the high desert’s ubiquitous juniper forests, into a golden sea of bunchgrass. The grass sways in the breeze as the path descends over small red rocks that loosen and slide underfoot as I try to keep up with a lanky Forest Service ranger named Aaron Stockton. Few people know the Guadalupes as well as Stockton. A Carlsbad native, he’s spent years wandering the range’s many public trails and has rappelled into nearly impossible-to-access canyons. But his first love here is caving: Stockton is both the cave specialist and the district ranger (essentially, the supervisor) of the Lincoln National Forest Guadalupe Ranger District. Stockton is walking and talking—whispering, really—as the trail ends and we enter the mouth of Cottonwood Cave, which is situated on the side of a cliff about a quarter mile from the lookout tower. Daylight streams into the cave’s entrance, illuminating the roughly eroded limestone walls and jagged stalactites that hang like pink icicles from the ceiling. The cave floor crunches underfoot much closer to the entrance as Stockton feels his way around a tall formation known as the Praying Nun. “This is usually where you have to turn on your light, but it just keeps going,” he says. Then he stops and grows quiet for a moment. “I like to just listen to the sounds of it, you know? You hear the squeaking? That’s bats.” We could also hear the steady drip of water somewhere in the darkness. Guadalupe Peak, the Chihuahuan Desert sweeps into the distance beyond El Capitan. The night when I came to the edge of Wilderness Ridge, I sat for a while on the limestone perch above McKittrick Canyon and silently took in the enormity and isolation of this lesser-traveled region of the world. The last rays of sun disappeared, and the air cooled as night fell. I rustled a headlamp from my pack, flipped the switch, and found my way back to the trail winding through a range that knows no bounds. Find more information and a detailed map of the Guadalupe Ridge Trail at guadaluperidgetrail.com. 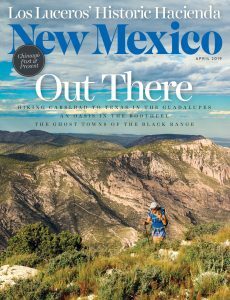 For 98 years, locals and travelers have turned to New Mexico Magazine as the expert in the state’s world-class art, food, and outdoor recreation. Use promo code ITXH19 and get 12 issues for $15. 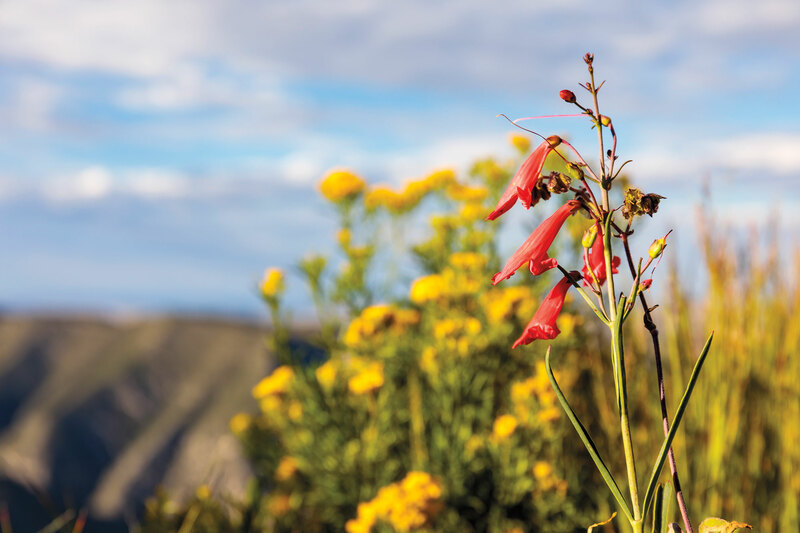 For our April 2019 issue, we partnered with New Mexico Magazine to share the story of this dual-state treasure with our neighbors to the west.